If You Were A Chair, What Brilliant Gem Would You Be? What's your favorite gem? Diamond? Amythyst? Topaz ? The line of Brilliant, by Robby e Francesca Cantarutti, has many brilliant gems ... in chair form! The Cataruttis' chair design, manufactured by JDS international, is showing off its brilliance at design shows worldwide as a perfect chair for restaurants, offices, and residences. 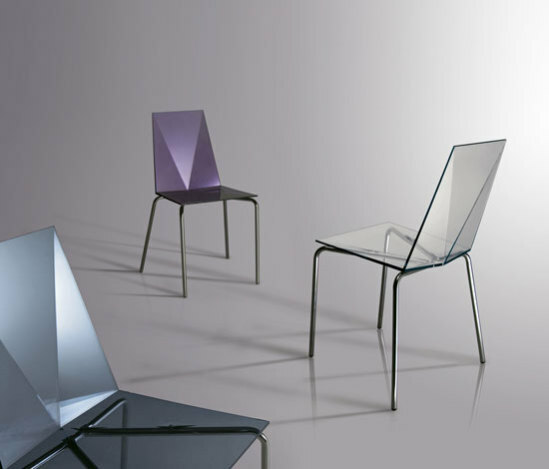 The translucent, multi-faceted Brilliant chairs are made of a high-clarity, high-impact plastic called polycarbonate. The clarity of the plastic, as well as the perfect geometry of the design accounts for the beautiful shadows the Brilliant chairs cast in smoke, blue, lavendar, yellow, and red. There are three styles of the Brilliant chairs. The black chairs (look like onyx to me! ), as well as the white and grey, are made of opaque nylon. Here's a Brilliant desk chair in transparent smoke. Another Robby e Francesca Cantarutti style. 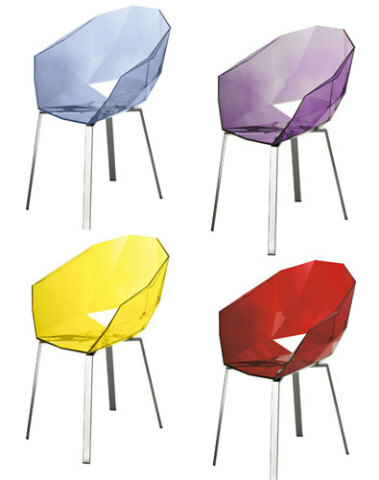 called the Ruby, is an armless chair with fewer facets than the Brilliant design. The Ruby is stackable. And, because you don't have angles on your bottom, these chairs have just enough curve on the inside of the chair's facets to conform to it, which makes the Brilliant and the Ruby comfortable as well as stylish. Great chairs! Don't you just love the look of these new contemporary furniture pieces? If you liked that one, check out the Charles and Ray Eames Collections, I've found some beautiful chairs designed by them at Office Designs. They're my favorite because they ship for free and I love their customer service reps.